ANAHEIM, Calif.—In Disney Pixar’s “Cars 3,” Armie Hammer (“The Lone Ranger,” “The Social Network”) voices the character of hotshot new car on the block Jackson Storm, presenting the toughest competition to date for hero racecar Lightning McQueen, once again voiced by Owen Wilson. Directed by Brian Fee (a storyboard artist on the previous “Cars” installments) and produced by Kevin Reher (“A Bug’s Life”), “Cars 3” finds Lightning McQueen, the bright red racecar champ of the previous films, in the dust behind a new generation of flashy high-tech racing cars, led by Jackson Storm. After losing a race to the new upstart, Lightning is emotionally crushed and has to find a new way to compete against this new generation of racing vehicles. He enlists the help of a young technician, Cruz Ramirez (voiced by comedienne Cristela Alonzo), with whom he learns some new high-tech training methods while sharing with her his old school, practical racing skills. Though longtime former racer and mentor Hudson Hornet (voiced by the late great Paul Newman, using vocal outtakes from previous films) is gone, he continues to inspire #95, who preps for the all-important Piston Cup race where he hopes to redeem himself on the track. Alongside Lightning McQueen, returning voice characters include the beloved Mater (Larry the Cable Guy), Sally Carrera (Bonnie Hunt), Luigi (Tony Shaloub) and Pixar lucky charm John Ratzenberger (as Mack the semi), along with new four-wheeled characters businesscar Sterling (“Castle’s” Nathan Fillion), demolition derby school bus Miss Fritter (“Orange is the New Black’s” Lea DeLaria) and statistical analyst sedan Natalie Certain (“Scandal’s” Kerry Washington). Hammer, Wilson, Alonzo, Washington and Larry spoke about being part of the “Cars” universe prior to the third installment’s premiere near Disney’s California Adventure, which has an entire section devoted to the popular animated franchise. Q: Why do you think the “Cars” movies have been so popular over the past decade? Wilson: (People like the cars and the characters but) I think the animators did a pretty good job. I know when they were first animating the cars, when they were figuring out how they were going to do the eyes, there is something that is kind of human or inviting about the expressions, so I think that helps make the cars more relatable and lifelike to people. That’s a big part of it … and, the voices. Q: Armie, your character is part of a next generation of high tech racecars. How does he impact Lightning McQueen’s world? Hammer: It’s definitely a change. He’s part of this class of racers called the Next Gen and they’re faster. They’re smarter. (smiling) They’re better looking. Just saying. (Pointing to one of the Next Gen models) Just look at that thing; it’s pretty darn good looking. Wilson: Now that you mention it, it does look pretty cool. Hammer: I want to order that thing and take it home. But at the same time, there’s not the same heart in it, not the same spirit and love in it. It’s more of a technicality. So that’s hard. It’s a big paradigm shift in a world where so much of it is the love of the (sport). Q: Cristela, tell us about how your character, Cruz Ramirez, helps Lightning McQueen? Alonzo: Cruz is a great little character. I loved playing her. What I like about her is that she’s very good at what she does but at the same time, she still has doubts about herself regarding the same skill she uses to coach the cars to become the best they can be. She’s very relatable to boys and girls who may also have doubts about things. They may not know how they are going to be able to pull something off. At the end of the day, the only way you can ensure that you can do your best is to actually go for it and trust your instincts. Q: Kerry, you voice the character of number-cruncher Natalie Certain. Why is it important that your character represents a strong female image? Washington: It’s fun to see (female characters) in the film that are brave, smart, courageous and also teachable. They’re women that balance extraordinary talent and intellect but also are humble enough to learn the lessons they have to learn by the end of the film. She learns that you have to step into your greatness; it’s not as simple as numbers. Heart and passion are the most important thing. Alonzo: What I like about “Cars 3,” is that it’s really about skill. We don’t really reference that she’s a female driver. We talk about how good she is. We see it in the story. It’s not about a boy or girl doing something. It’s about the best person doing the best that they can. That’s a great way to get a story about female empowerment by reminding everybody that we’re all pretty much alike. If you work hard and have the skill, whoever is the best will win. 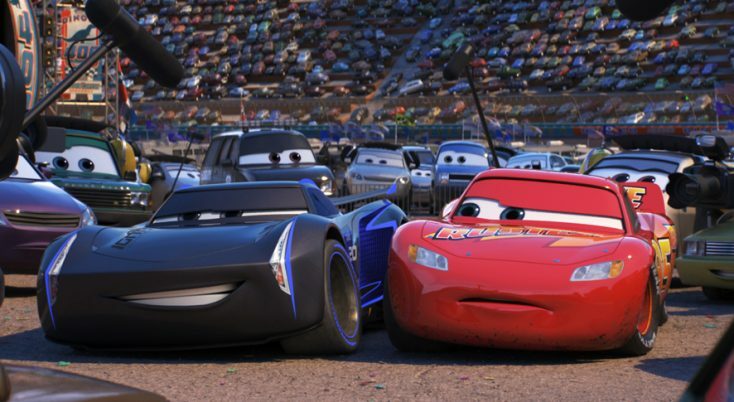 Q: Lightning McQueen takes on a mentor-like role in this installment and, of course, he was mentored by Doc Hudson. Who have been your mentors? Wilson: I guess my parents and (producer/director) Jim Brooks, who brought us (he and brothers Andrew and Luke) out to Los Angeles and gave us our big break. Hammer: In this job, you get a chance to work with so many people who know things that you don’t. I feel like I’ve had so many different mentors in my career. It would be hard to pick one but every time you work is an opportunity to get a new mentor for at least for that period that you can learn something from. Q: As a parent, how does this movie resonate with you? Wilson: I’m sort of a mentor to my kids. It depends on which day you get me on. Today I am. My kids are here today running around the park and they’ll go to the premiere tonight and that’s just exciting for me. It’ll be fun to watch the movie with them and get their reaction. It makes it a cool experience. Hammer: I have a young daughter who is almost a little too young (to watch movies) but she is starting to appreciate them. But, the fact that there is a strong female figure and is told that you can do anything you want, as the father of a little girl, I’m glad to be part of a movie that can carry on that message. I’m happy to be in that kind of movie. Q: Owen, Lightning McQueen has a friendship with Cruise that is supportive but not romantic. Can you talk about that? Wilson: That also goes back to the mentor question—the idea that we all do need encouragement and everybody sometimes falls a little short or fails and the idea that we are sort of part of a community. It’s an important message for everybody. (Cristela and I) recorded together because (our characters’ relationship) is a big part of the movie—the support that she gives me and I hopefully give her. Q: Larry, you’ve voiced this lovable Mater character in three films now. What is your first memory of the “Cars” world and why does this 10-year-old franchise continue to resonate with audiences? Larry the Cable Guy: People can relate to the characters and it’s just fun for the little dudes. They have a lot of heart in them. As far as my character goes, I think a lot of people would like to have a neighbor like Mater. He’s dependable, he’s lovable and sweet. He may not be the smartest fork in the knife drawer but he’s a faithful friend and that’s what everybody would like to have. It’s cool seeing the progression and how these movies go through things and grow like everybody else. “Cars” movies have been around a long time so people relate to them and it’s cool to see every movie and the different situations.